The Time Has Come For A New Age Of Adventure! 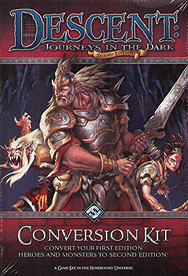 The Descent: Journeys in the Dark Second Edition Conversion Kit allow players to bring all the familiar faces from the previous Descent: Journeys in the Dark releases into a whole new world of adventure. This Conversion Kit includes all the printed components needed to use all of your heroes and monsters from Descent: Journeys in the Dark First Edition with this exciting new edition. 48 Hero sheets, representing the heroes from Descent: Journeys in the Dark First Edition: The Well of Darkness, The Altar of Despair, and The Tomb of Ice expansions; the heroes introduced in DungeonQuest, as well as the promotional heroes Jonas the Kind, Nara the Fang, Tobin Farslayer, and Truthseer Kel. 50 Monster cards, representing the 25 monsters from Descent: Journeys in the Dark First Edition as well as The Well of Darkness, The Altar of Despair and The Tomb of Ice expansions. 3 Familiar cards for Pico, Skye, and Brightblaze.